Convert GIF to MP4, MOV, MKV and 1000+ video/audio formats. Most people are searching online for the best technique to convert GIF to MP4, to enable them to playback their GIF files on their media player. The GIF animated files should instead be converted to MP4 which is the most popular file format compatible with a majority of devices. The compatible devices include Android phones, iPhones, Mac, Windows, and others. This article is focused on listing out 15 techniques for converting your GIF to MP4. 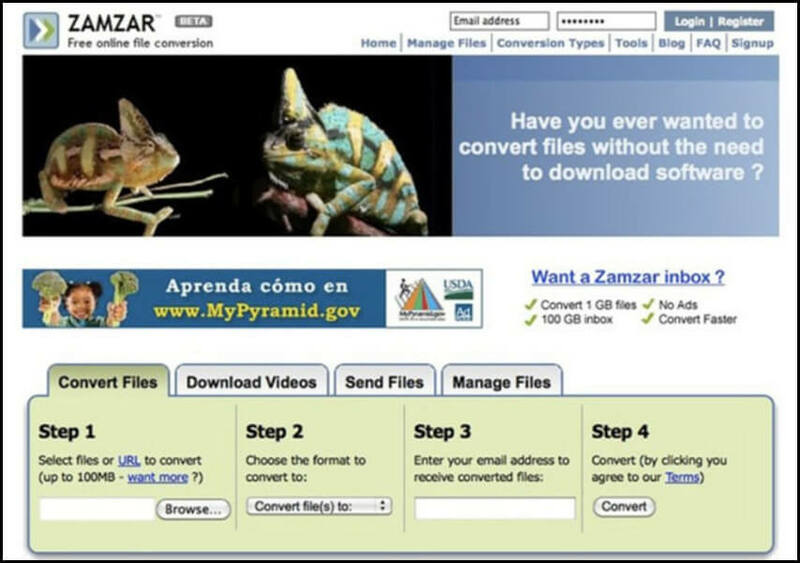 Zamzar is an application designed for file conversion from one format to another. It is equally used to convert GIF to MP4. Some of the other file formats you can convert your MP4 file to using Zamzar are 3GPP2 Multimedia, 3GPP Multimedia, AC3 Audio files, and other advanced Audio files. Step 1: First, input the location of the particular GIF file you want to convert to MP4, or the URL into the field provided. Step 2: At the completion of the inputting process, selecting the output file to MP4 by clicking at the “Convert files to” button or bar. Step 3: Input the email address where the converted file will be sent to, and begin to convert by clicking at the “Agree to terms.’ This will only take a few minutes to be completed. 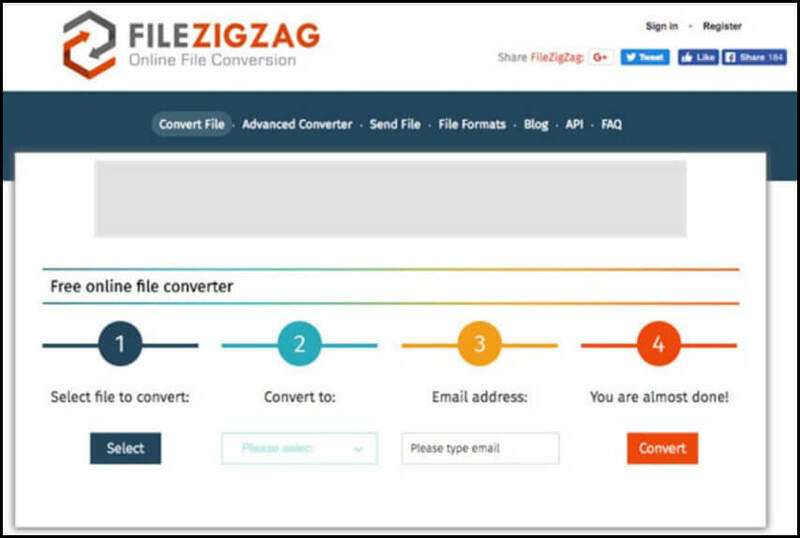 Among other converters available for a GIF to MP4 online, the FileZigZag is an excellent choice for conversion of GIF file to an MP4 file format. The process is just as simple as what you need is to upload your GIF file, and ensure you select MP4 from the converting list provided. Check the details below. Step 1: Get File ZigZag on the internet, and input your GIF file that needs to be converted to MP4 through simple mouse clicks on “select” button, then chooses the file you want to convert from your computer. Step 2: Select the output file type for already converted file and choose MP4 format as your output file from the provided drop-down list. Step 3: Input email address through which the new MP4 file will be received. Start converting the file clicking on the “Convert” button if the process is successful, you will see progress in the already completed progress bar. For versatility in file conversion, the ideal choice is Convertio. This is a great file converter suitable for changing a GIF file to an MP4 file. It is also good for converting GIF to other file formats including PNG to JPG, PDF to Word, and others. 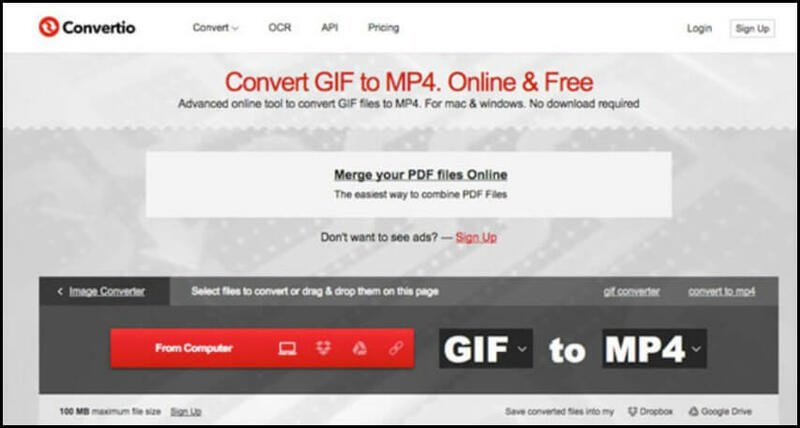 Getting this great file converter will help you learn how to convert GIF to MP4 the easier way. Step 1: Get Convertio, and input your GIF file needed to be converted to MP4. Click “Select File to Convert”, and then select the file. Step 2: When you have inputted your GIF completely, you will be provided with an opportunity to select your output file format for conversion. In this case, choose you should select “MP4” from the provided “Video category” chart. Step 3: Begin your video conversion by clicking at “Start”, and the completion progress bar will be displayed. After the completion of the GIF to MP4 conversion, you then need to download the new MP4 files. Irrespective the format of your video file, you can always find a GIF to MP4 converter online and one of them is CloudConvert. This file converter is equally great in converting your GIF file format to MP4 without diminishing the quality. 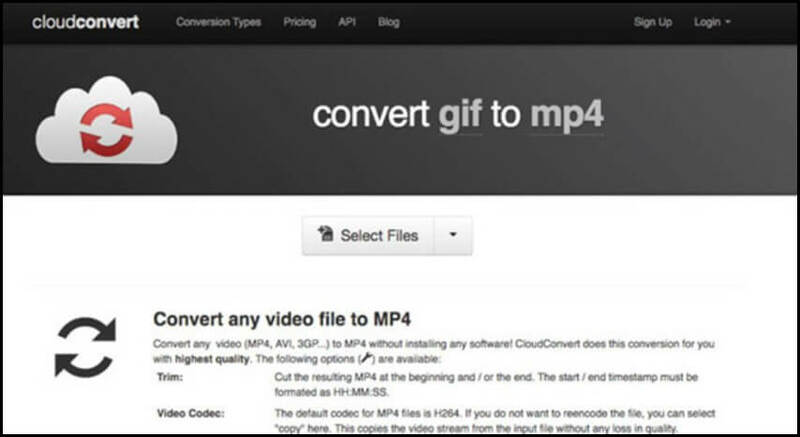 Below are the steps to get your GIF converted to MP4 format using the CloudConvert file converter. Step 1: Go to the CloudConvert site online, and then input your GIF files by clicking the “Select Files” bar, choose GIF file you want to convert from your computer document. Step 2: After selecting the GIF file you are planning to convert, select drop-down list and click “MP4” amidst the video category, and set it up as your convert format. Step 3: Hit on the “Start Convert” to start converting, and the complete progress bar will be displayed. When the conversion process is completed, you can then download the file converted. 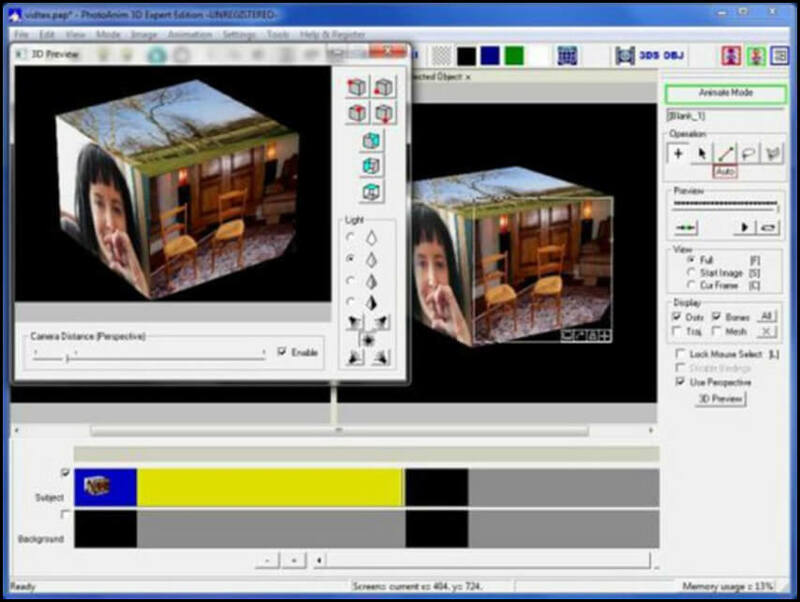 One of the most excellent software you need to convert animated gift to MP4 is the Thundersoft. This software also offers added settings for file conversion such as bitrate and frame adjustment prior to conversion. Step 1: Load your GIF file you are planning to convert to MP4, and with drag and drop action, move the GIF file into the program. Step 2: From the converting list, select MP4 then hit “MP4” as your output format, other file formats are also allowed here. Step 3: When you have finished that, you can begin to export the converted files by hitting “Convert” to change the GIF into MP4 file format. Lastly, you need to download the new MP4 file format at the completion of the entire processes. The Ezgift is another good video file converter suitable to convert video from GIF to MP4. It can be used to convert your uploaded videos or the Video URL in a more convenient and simpler manner. The details on how you can use this Ezgift to change your GIF file to MP4 are provided below. Step 1: First of all, you have to upload GIF image or video from your computer system into the Ezgift to carry out the conversion. Then, start clicking “Choose File” to get the GIF image or video converted to your desired MP4 format. You can equally achieve the same result when you use the video. Step 2: Hit the “Convert to MP4” icon and the software will output your converted MP4 format with extremely quality h264 encoding. In that regard, you can always convert your GIF to an MP4 format. For video file format conversion, the Filmora Video Editor is known as All-in-one software. It is suitable to convert GIF to MP4 online. Apart from being a good video file converter, it is also good for video editing and can be used to add some unique effects to video. Step 1: Open Filmora app on your computer and import GIF file by clicking at the “Import” icon, then select the GIF you want to convert. Importing the GIF file can equally be done through a simple drag-and-drop method. Step 2: Select MP4 as the output file format, and start exporting the file by clicking the “Export” icon. With this software, you can change GIF to MP4 within the shortest time. For your free GIF to MP4 app, the FFMPEG is the choice. With this video converter, you can convert GIF videos on any hosting website online to MP4 with the quality maintained. It comes with inbuilt DVD converter compatible with various mobile devices. Step 1: Run FFMPEG on Computer, either Mac or Windows. Step 2: Input these codes to convert your GIF file to MP4. Step 3: You can now download the new MP4 to the computer. The ConverterLite is among the best video file converter for GIF to MP4, and best option while searching for a GIF to MP4 converter download online. It is designed to help in converting not only videos but also audio files. This software does not take up much storage space, and you can get it downloaded to your Windows or Mack without taking up much space. Step 1: Input the GIF video into the ConverterLite program. You can do this through two methods which are through the use of the file URL or through drag and drop method. Step 2: After loading the files, choose your output file format, which should be MP4 in this case. Step 3: Begin the file export by hitting the “Start” button. You only need to exercise little patient for the process to finish converting, before you can download the MP4 files to your device. The AVC also was known as Any Video Converter is truly an excellent choice while looking for a free good video converter. With this video file converter, you can convert GIF video files to MP4 online irrespective the video hosting website still maintains the quality. It also comes with built-in DVD compatible with different mobile devices just like the FFMPEG. So, it is suitable if you want to learn how to convert a GIF to MP4 on the internet. Step 1: Hit “Add Video (s)” icon to input your GIF file or files in the program. Step 2: Select your output format, which should be MP4 from the top drop-down menu to convert your GIF files to MP4. Step 3: When the process is completed, hit the “Convert Now” icon to begin the conversion. At the end of the process, you can download the MP4 files. The Video2me is a well designed all-encompassing GIF video and GIF to MP4 online converter. It is suitable for doing so many things including video collage preparation, merging of videos, trimming of videos, creating of video collage, conversion of GIF video file format to an MP4 file format and lots more. Step 1: Download the program online and install into your Android phone, then select the video option. 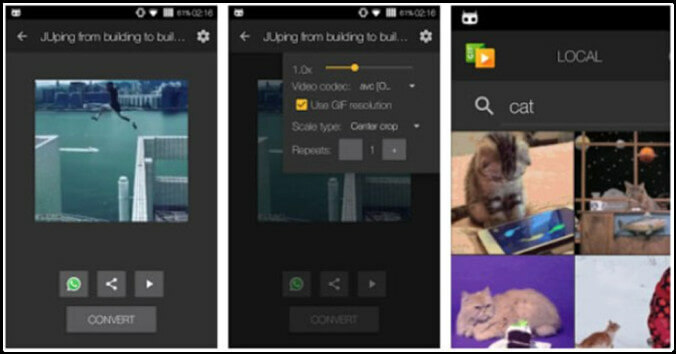 Step 2: Choose GIF2Video option, and set the video file parameters. Step 3: Convert your GIF video file to MP4 consequently. GIF to Video has great features that made it an excellent choice when there is a need for GIF to MP4 convert. It is also good for searching and browsing local, Reddit, Giphy GIFs, and lots more. You will not only convert your video file using this program but will also be able the files on your chosen social media. Step 1: Import your GIF video files from Reddit, Giphy or local GIFs into the program. Step 2: Hit the “Convert” icon to have the GIF files converted to MP4 files format. Step 3: Set the video codec, the speed, scale type as well as other parameters. 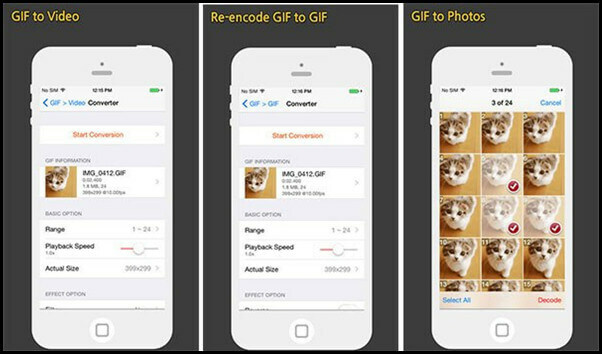 The GIF Cracker is a perfect program when there is a need to convert GIF photos and change GIF to MP4 on iPhone. This is important as it will enable you to get the firm on the highly compatible format to many devices. It will make your social sharing and play on your chosen device achievable. Step 1: Choose your GIF photo or video ready to be converted to MP4. Step 2: Set up your conversion option. 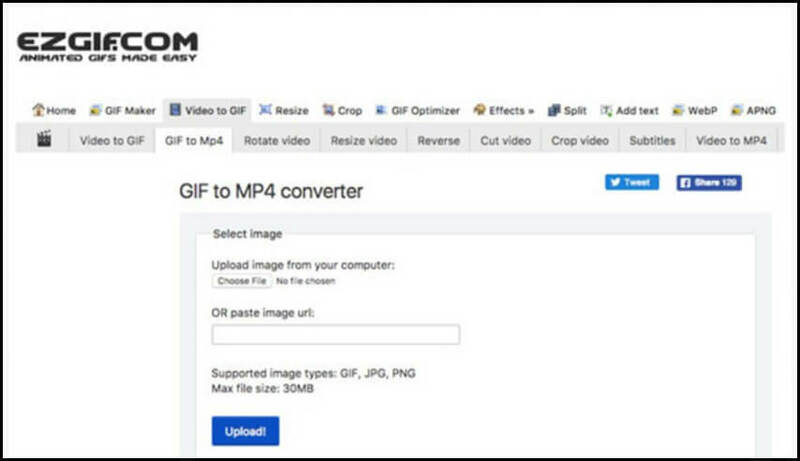 Step 3: Choose the “Start Conversion” option to get the GIF file converted to MMP4 immediately. 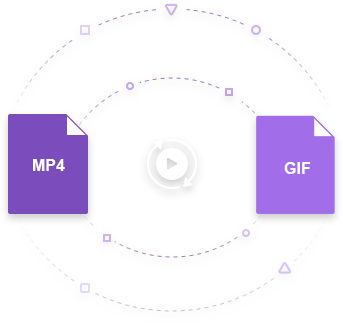 With Gifvid, you can convert from GIF to MP4 and vice Versa. The converted file can be shared on different iOS platforms including iMessages, Social media sites, Imgur, and others. Step 1: Run Gifvid program on your iPhone and hit the “Create” option. Select “GIF to Video” option in order to get the file converted to MP4. Step 2: Select GIF files from iPhone, and adjust the resolution of your output as well as the video loop if you want. Step 3: When the conversion is completed, you can go ahead and share your MP4 files with friends on iMessage, and other Social Media. 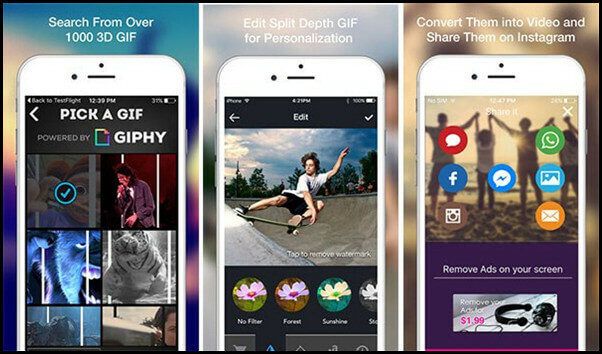 Your GIF file conversion will be faster, easier and better on iPhone with the help 3D GIF. With this program, you can convert gift to MP4 Instagram. These include Twitter, Reddit, GIPHY and lots more. You can even convert the files and share them on social media such as Instagram, Whatsapp, Facebook or even to your own iPhone gallery. Step 1: Search around for more than 1000 3D GIF files from Twitter, Reddit, GIPHY, and imgur. Step 3: Convert the GIF file into MP4, and then share the converted files on your Instagram. 1. How to Convert MP4 to GIF? The conversion of MP4 to GIF needs not be tasking when you have the right video converter. Wondershare UniConverter (originally Wondershare Video Converter Ultimate) is just the right application to use for your conversion. 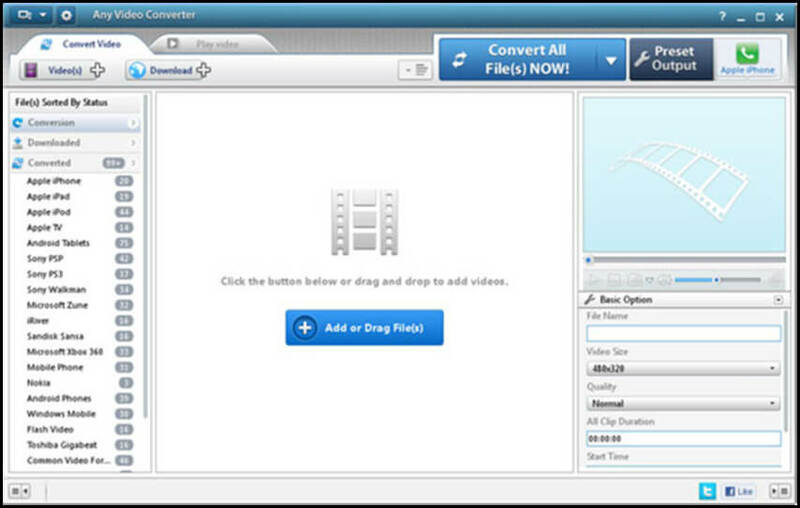 This video converter is easy to use with simple steps. 2. How can one convert animated GIF video to MP4 Photoshop? In the dropdown list, tick the “Make Frame Animation” check bock. Then, select a specified range of video importing every 2nd, 3rd, 4th… frame. 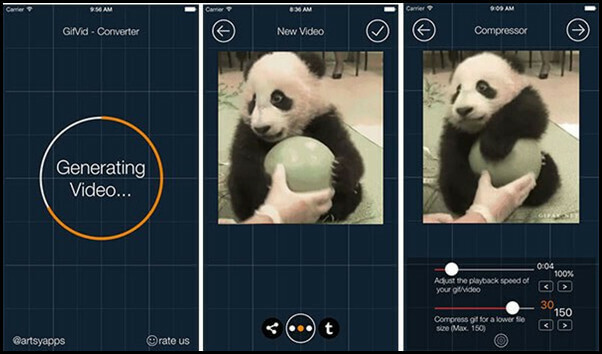 Save the output and begin to enjoy your animal GIF in MP4 format. 3. How to remove GIF to MP4 loop on Photoshop? Run your video file in Photoshop. Choose the file image, and click the save for Web image. Search whether your Animation icon at the lower part of the save dialogue box has changed to another color from grey. Set your looping count, and then, hit on the preview menu button for animation. Hit the save button. 4. Which is the best video converter from GIF to MP4 Instagram? There are many video converters that can be used to convert GIF to MP4 for the Instagram post, but Wondershare UniConverter is just the best in terms of ease of use, friendly interface, and other features. Have a free try now.